Staad, Switzerland: – Microbiology and organic fine biochemical specialist manufacturer and developer Biosynth AG will exhibit a leading-edge range of pheromones at the 2018 Annual Biocontrol Industry Meeting (ABIM) in Basel, Switzerland. 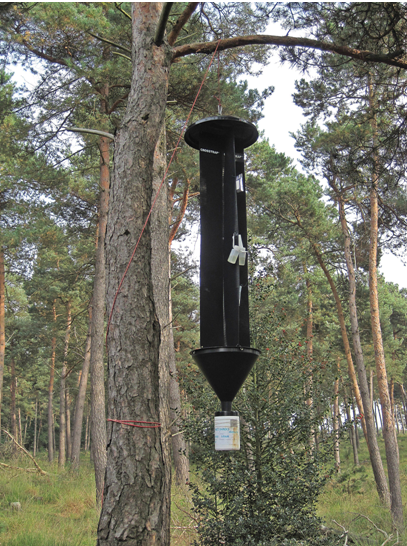 The Biosynth stand at Booth 68 at the Basel Congress Center will display the pheromones used in the pheromone traps that are important in pest monitoring and protection of woodlands and crops. It will also show a range of plant growth regulators, auxins, cytokinins and other research chemicals for plant sciences. “We believe that using pheromones in biocontrol is a reliable, highly selective and safe method. With pheromones it is possible to suppress populations of target pests while conserving the beneficial species,” commented Biosynth’s Business Development Director, Rolf Rolli. “Attending ABIM allows us to talk directly to the professionals who are influential in the fields of organic agriculture, biocontrol manufacturing and the plant biotech industry. Many of these people already recognise Biosynth as chemical experts providing innovative and assured quality pheromones and other plant protection products,” said Mr. Rolli. “We are an independent, fair and economic chemicals developer, manufacturer and supplier that is becoming increasingly well known for its great expertise in indole chemistry. We have been producing substances, such as the plant growth regulator IAA, for decades,” he added. Biosynth has recently increased its capacity and cGMP capabilities for API’s and added organic biocontrol products to the portfolio. For example, to guarantee supplies of the bark beetle aggregation pheromone Chalcogran, which is increasingly used in forestry for protection of spruce trees, Biosynth has recently developed a more efficient process for its production. It has also welcomed to the Biosynth Group the Slovakian-based organic chemistry specialist TAU-CHEM Ltd., with its expertise in the chemistry of heterocycles such as furans, pyridines, thiophenes, etc., as well as being a producer of pheromones for biocontrol uses. The Swiss-based chemical supplier and manufacturing CDMO specializes in microbiology and organic fine chemicals in the field of bioluminescence and chemiluminescence probes, fluorescent probes, chromogenic substrates, enzyme substrates, indole derivatives and special chemicals. The company’s more than 100,000 products are widely used in microbiology, molecular biology, diagnostics, pharmaceutical industry, chemical industry, food and environmental testing. Development projects, small and industrial scale manufacturing as well as global sourcing are all core competencies of the group, which is headquartered in Staad, Switzerland, its base for its production, sales, logistics, QA and QC, with operating subsidiaries in the USA (BIOSYNTH International, Inc, Itasca, IL) and in China (BIOSYNTH, Wuxi). The Annual Biocontrol Industry Meeting (ABIM) forms a premier forum for the biocontrol industry to discover and unveil new products, discuss market opportunities, present latest research and recognise latest regulations worldwide. ABIM 2018 is a three day event opening October 22 at the Congress Center in Basel, Switzerland. The previous conference attracted more than 1,000 delegates from 54 countries. ABIM 2018 is expected to be even bigger, with an enlarged exhibition area and increased networking facilities, including an improved online 1 to 1 platform. Keynote speakers for 2018 include Hans Dreyer, the Director of the Plant Production and Protection Division of the Food and Agricultural Organization (FAO) and Russel Blair, CEO of Andermatt. The event is organized by the International Biocontrol Manufacturers Association (IBMA) in partnership with FiBL. Further information at: https://www.abim.ch/home.html/. Click on Biosynth at ABIM 2018 for more information. Click on Plant biotechnology for further information.